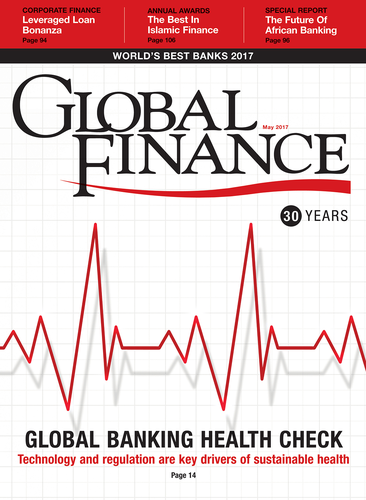 Global Finance: How are you performing in North Africa? What are the challenging markets, and where are the best opportunities? Adnan Ahmed Yousif: At present, we have presence in Egypt, Algeria, Tunisia, Sudan, Libya and lately in Morocco (under construction). All these units are performing very well and expanding in terms of business, branches and revenues. When you take into consideration, on the one hand, that Islamic banking is relatively new in this region, and on the other hand, the size of its markets, it is easy to imagine the huge potential for Islamic banking. The total population of this area has reached 200 million with total GDP exceeding $1.2 trillion and per capita income averaging $7,000. The economies of these countries are under transformation toward more reforms and diversification. A climate such as this creates substantial potential opportunities for Islamic products and services. GF: What Islamic products and services are seeing good demand? Yousif: Normally, the Islamic products and services are concentrated more on fulfilling real needs for economic entities and individuals such as [shariah-compliant products] musharka, ijara and istesna financings, [small and midsize enterprise] financing, education- and health-related products. There is also increased demand for online and credit-card Islamic products. GF: What markets are you looking to expand into? Yousif: In fact, we are looking more for the emerging markets in Africa and Asia. As I mentioned, Islamic banking is relatively new in these markets, and they are large and growing markets. Through our alliances and partners in our units in North Africa, we can expand further to other African countries. Some European markets, such as France, are also under our consideration for expansion. GF: What is your view of the prospects for 2017? Yousif: We will continue our strategy of growth through increasing market share and expanding into new markets. Our units will continue to emphasize product innovation and excellent service. Notably, we will seek to make digital banking a competitive advantage and have started to work with our subsidiary banks to advance this further. This will be another challenging year in our markets. Correspondingly, we are expanding carefully, with great emphasis on managing costs and strengthening our operating units. Overall, this will further strengthen the Al Baraka Group. Our group culture is a balanced and cautious approach to asset management.